Apple released a software update for both generations of the iPhone and iPod touch late Thursday night Pacific time. The update, version 2.2, features major additions to the Maps application, adds the ability to download podcasts directly from the device, and adds several more features while also offering bug fixes. The version 2.2 update is approximately 250 MB in size and is available via iTunes by connecting an iPhone or iPod touch and clicking the Check for Updates button. 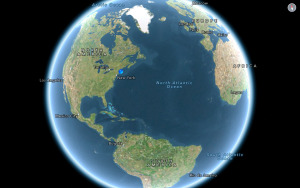 Google Street View on the iPhone. The orange icon brings you to Street View. The Maps application has received a major upgrade, including support for Google Street View, Google’s service that allows you to see actual panoramic photographs taken on the ground in various locations and attached to map data. When you find an object in Maps, if Street View is available there’s an orange icon. Tap it, and you fly in to the location, with a quick zoom to the map, transition into Street View, and 90-degree rotation—Street View only works in landscape orientation. 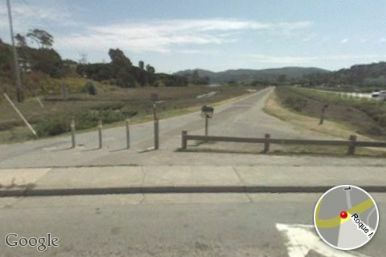 Once in Street View, you can slide your finger to rotate the panorama. A corresponding circle in the bottom-right corner shows you where you are on the map and what direction you’re looking. You can also tap on arrows to move around on the street. There’s even a Report button to “report inappropriate content”—someone naked in a window, maybe?—to Google. Maps also gains two variations on Google Maps that have been available on Google’s web-based map site for some time: public-transit directions (available in limited urban areas), and walking directions. At the top of the map view when you’re in Directions mode you’ll find three buttons: driving directions, transit directions, and walking directions. Tapping any of them will re-draw the directions to fit the requested form of locomotion. Other enhancements to maps include the appearance of addresses on dropped pins and the ability to share locations via e-mail. At the bottom of the detail view for a location, there are now three buttons in a row: Add to Contacts, Share Location, and Add to Bookmarks. 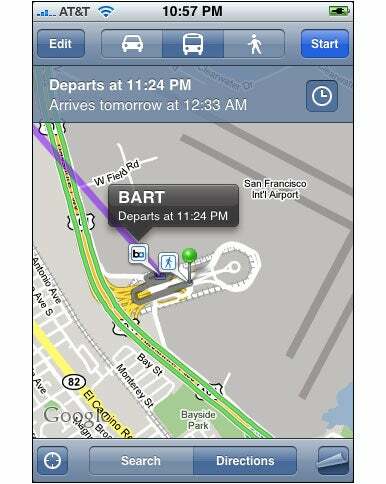 Tapping Share Location will create a new e-mail with a Google Maps URL tied to the location in question. Apple promises that this update includes improvements to the iPhone’s telephone functionality. Those who have had issues with the phone’s reliability will be thrilled to know that Apple claims this update will lead to a decrease in “call set-up failures”—presumably those times when you try to initiate a call but end up with a “Call Failed” message—and call drops. Apple also claims that with this update the sound quality of visual voicemail messages has improved. 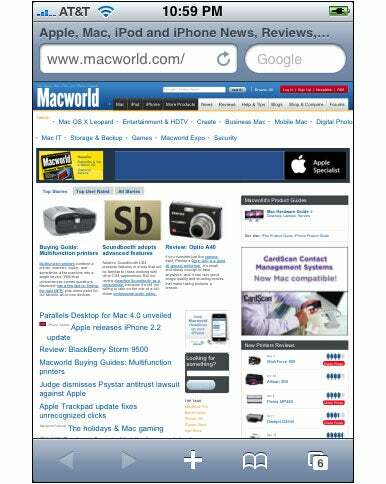 According to Apple, this update improves the “stability and performance” of Safari. In addition, Safari’s interface has been streamlined so that the URL and search boxes appear together on one line, with the “http://” preface of the URL hidden away. This new update adds the ability for the iPhone to download podcasts directly without connecting to a Mac or PC running iTunes. Although the resulting downloads are accessible from the iPod application—and a Get More Episodes link has been added beneath the list of podcast episodes—the actual finding and downloading of podcasts happens in the iTunes application. The interface is quite similar to the one you’d use for purchasing music on the phone; the big difference is that all the podcasts are free. Tap the Free button once to turn it into a green Download button; the second tap begins the download process. 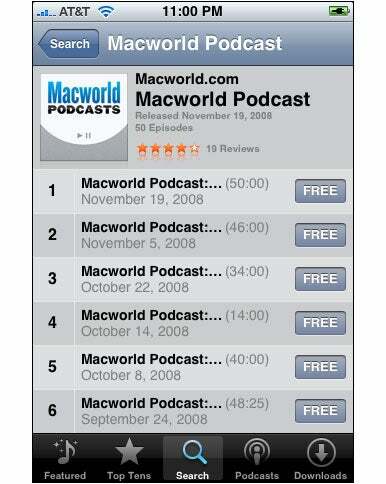 Once the download is done, the podcast is added to your podcast list in the iPod application. Podcast downloads in the iTunes app on the iPhone. If you’re on page seven of your home screen and realize you need to get back to that app you’ve put on page one, with iPhone 2.2 you can save a lot of time—instead of frantic swiping to get back to page one, you can just press the home button. Whenever you’re in the home screen, pressing the home button will take you back to the very first page. There’s also a new preference that lets you turn auto-correction for typing on the iPhone’s keyboard on or off. And bubbling beneath the surface are a clutch of security improvements. You're now prompted to rate an app before sending it to the cornfield. As always, Apple has left some easter eggs in the update—features added but not documented in the release notes. So far we—along with some eagle-eyed readers—have noticed a few of them. Previews of screen shots now display in iPhoto; previously screen-shot images appeared in iPhoto as blank images until they were imported. Seen any new features we've missed? Please let us know in the comments below.